Providing all commercial floor covering including heat weld applications, concrete seal and staining, rubber flooring,carpet, vinyl, wood, and all specialty flooring. Carpet South Design has been in the floor covering sales and installation business for 15+ years, since 1995, and under the same ownership. Carpet South Design represents many quality manufacturers of floor covering materials, such as, Shaw, Mohawk, Beaulieu, and Armstrong to mention a few. The installers employed by Carpet South Design are highly trained and responsible individuals that take pride in their workmanship and attention to detail. Every effort is made to deliver on-time quality materials to the exact specification of the customer. Carpet South Design serves the greater Charlotte and Metropolitan Atlanta area. We have some of the BEST clients in the multi-family home business as well as many in the home building industry. Residential customers return and refer their friends and family to Carpet South Design because of the great value and excellent service. When you have a floor covering need, please let Carpet South Design prepare a professional proposal that will address your requirements, needs and wants. We believe that you will be very happy that you did. Thank you for all you do for us. 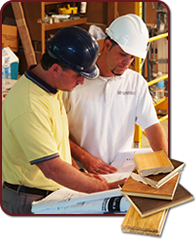 You are always so helpful with our flooring needs! I appreciate it. You make my job easier. Mary Jo KaiserPost Properties Inc.
No matter how big or small the job, Carpet South Design has always handled my jobs with the highest level of quality and service from the beginning to end. Carpet South Design really goes out of their way to take care of us. If I ever have any problems or concerns, they are always there for me. I feel they truly have my best interest at heart. Carpet South Design has been my flooring provider for over four years and I see the same installers on my job that I did four years ago.